We’ve got a lot to break down with this outfit. So let’s waste no time. If I know you, you are probably thinking the same as I did with these pants. Here is how it went with me: — do I like these pants? — I think I like these pants? — I like these pants? I like these pants. 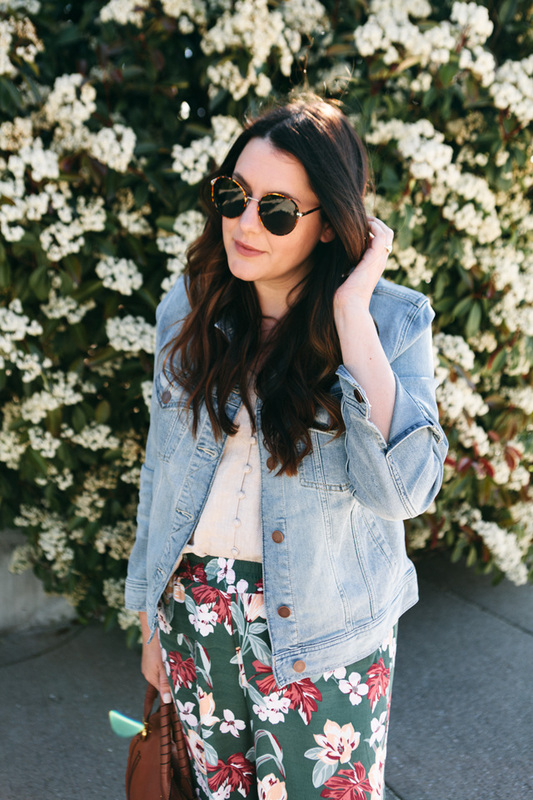 — I *really* like these pants and now want more loud florals in my life. 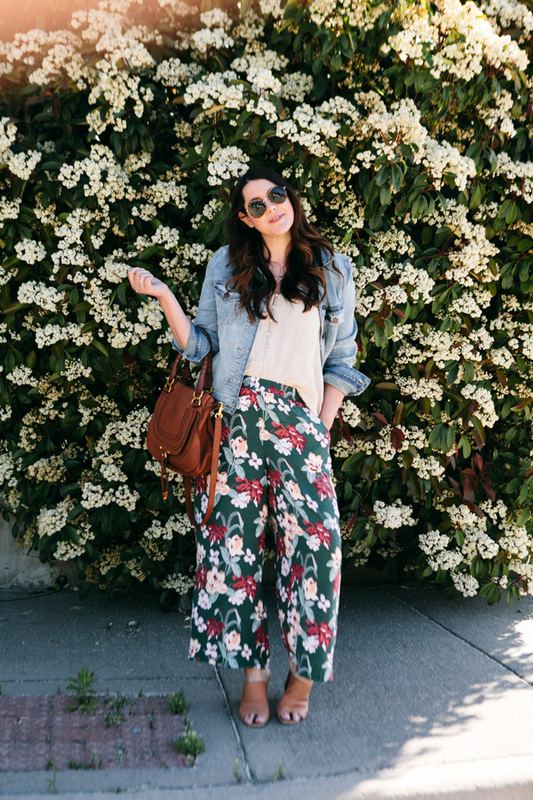 Okay so YOU may not want more loud florals in your life, but I bet you are questioning these pants. Ya’ll, I love them. I got so many compliments when I wore them! And I didn’t want to take them off because let me tell you — the heels are fooling you. You THINK this is a fancy outfit, it’s not because these pants are comfortable to the max. Pajamas in heels, basically. But that’s just our little secret. To everyone else, they are fancy floral pants and that’s the way it should be. You can find these pants here and for today they are 40% off with code BFF!! So I found this camisole and immediately knew I needed it for spring and summer. I call this a glue piece. This is a top that can really glue an outfit together. 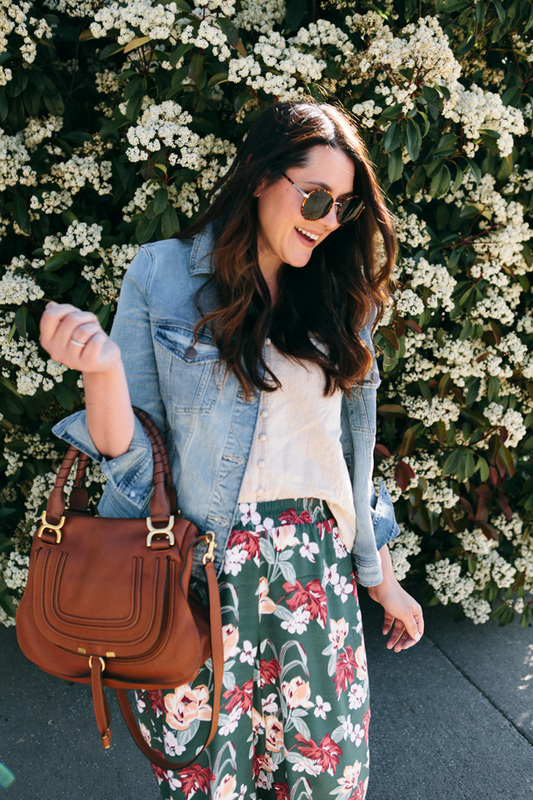 Like this outfit, it calms down the pants and pulls everything into an effortless look. Linen is nice like that. This top is well under $50 and this linen color is just the best. You can find it here! Do you like my sunnies? Let me tell you a secret. *whispers* they are $14, not even on sale. Just $14. Yeah I know it’s good, right?? So cute and so cheap. I’ve been wanting to try a more round shade trend but I didn’t want to commit. I love Karen Walker sunglasses but I COMMIT for years when I buy them. We are basically married now. You don’t just buy Karen’s, you commit to them for a lifetime. But I wanted a tiny bit more of a trendy look and didn’t want to commit in case I hated it and Nordstrom was like ‘I got you, girl — here try these $14 ones.” And I did. And I love them. I feel cool. I feel like I could have gone to Coachella and call it ‘chella for short. Instead, I went to Trader Joe’s and called it TJ’s for short. The pants run just slightly big! I’m in a medium with lots of room, so if you like them a bit more fitted size down. The camisole runs true to size, but more of a loose fit. My sunglasses are in the ‘Brown Tort’ shade. 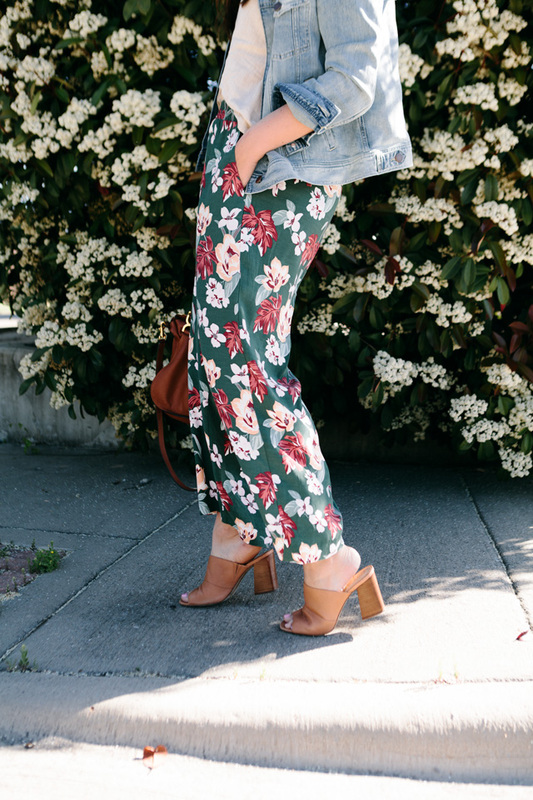 I am all about the florals right now and can’t wait to wear all of my floral dresses in Summer. 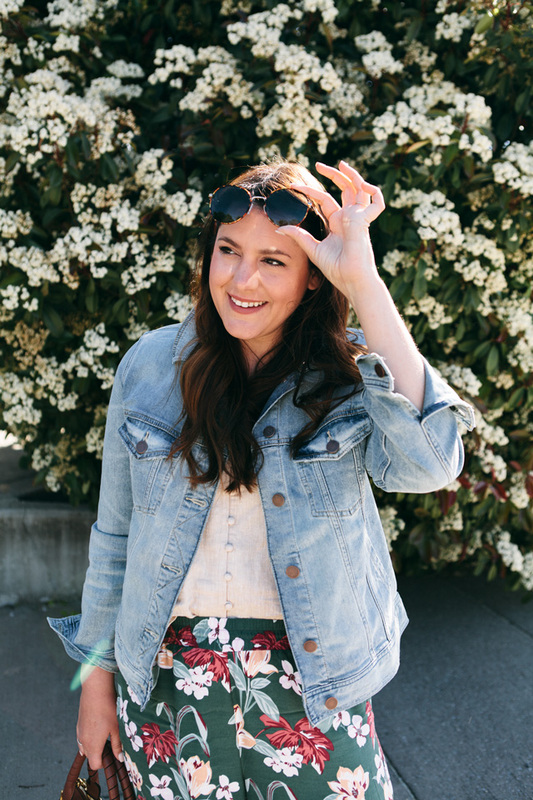 Those pants are bit tricky and I think that you’ve styled them perfectly with this cute cami and perfect denim jacket. 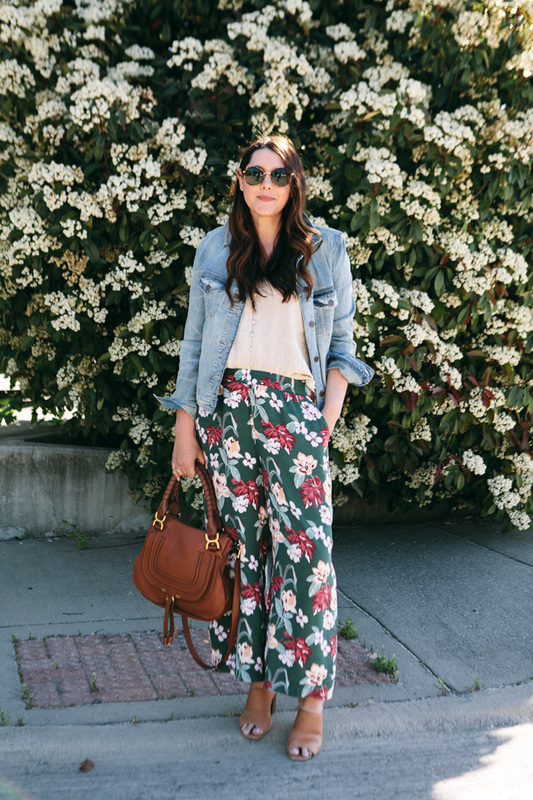 I am obsessing over those Floral pants! How did I miss it when I was at Loft! 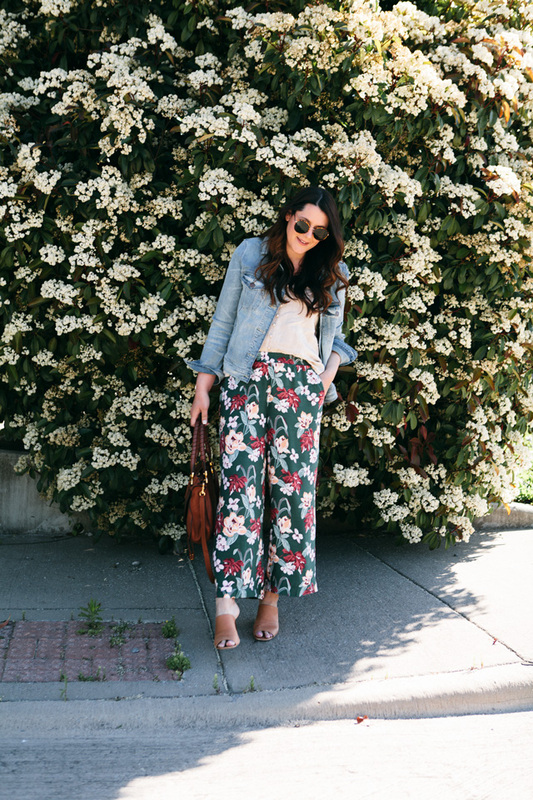 Printed pants are so my favorite piece this season! 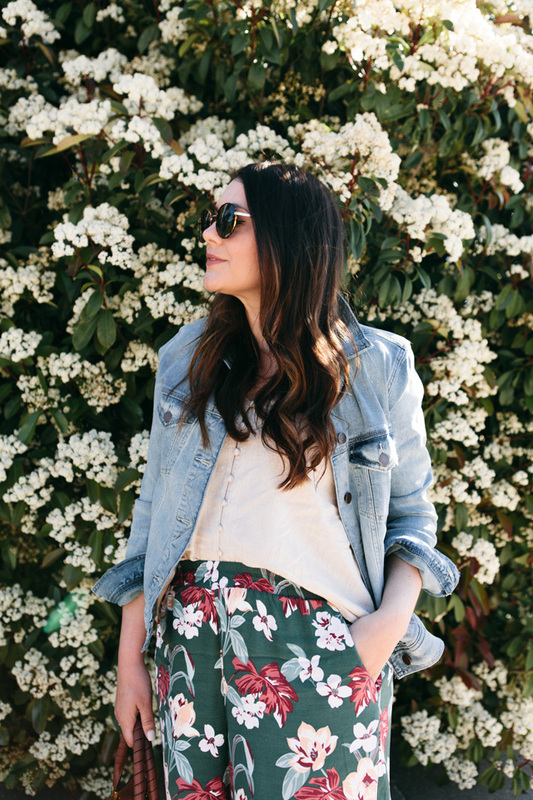 Nothing looks better paired with floral than a denim jacket. 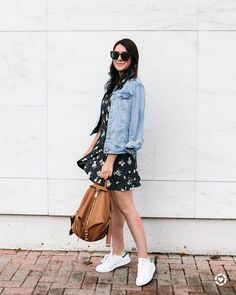 Great spring time look! You are hilarious!! Love this post! Very cute sunglasses! they look gorgeous on you!! Such mum pants 😉 I’m into it!